Elliot Wave Theory examines how groups of individuals react en masses to things in their environment and the psychological reasons for such reactions. Elliot Wave Theory then groups those reactions into predictable patterns or ‘waves.’ Once you have identified a particular trigger, you can then predict the coming waves and how groups will behave in accordance to those waves. The key component of Elliot Wave Theory are the Elliot Waves themselves. Several mini Elliot Waves will make up one bigger wave. The bigger wave is known as a fractal. 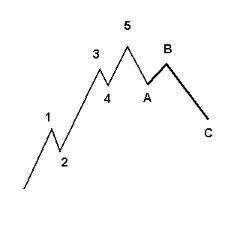 Fractals can then be grouped together to create an even larger wave showing a complete trend based one trigger, for example, my recent post on Gold Elliot Wave.